Every year the day after Thanksgiving, Hendricks County residents and visitors gather in downtown Danville to celebrate the start of the Christmas season during Christmas on the Square. One of the biggest attractions of this annual event is the opportunity for children to meet Santa and share with him what they want for Christmas. So to preview this year&apos;s event, we decided to go to the jolly old man himself. 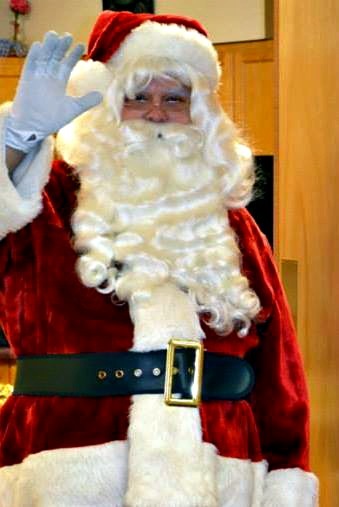 Danville resident Wade Wingler dons the red suit and white beard each November to bring Christmas cheer to local kids. Wade was kind enough to answer some questions about his experience as Santa, and why he loves Christmas on the Square. How long have you been serving as the Christmas on the Square Santa? Several years. In fact, I believe that I have been playing Santa since the inception of the event. Like round-the-world-trips on Christmas Eve, time works a little bit differently when you&apos;re in the red suit! One year a friend at church asked me to consider sitting in the red suit at the Santa House in the Winterland Light Show at Ellis Park. I had sort of lost the spark of Christmas and was looking for a way to reconnect with the childhood joys that I had remembered from long ago. After just one night of visiting with kids, hearing their Christmas wishes, and seeing the sparkle in their eyes, I was hooked! That year for Christmas, I received a very nice Santa suit and started looking for more opportunities to use it. The organizers of Christmas on the Square heard about my desire (and my nice new suit), and I immediately jumped at the chance to be part of this amazing event. My sleigh! Ho Ho Ho! Just kidding. It&apos;s certainly all about the kids, but I enjoy the reactions of the adults, too. Santa usually arrives on the Courthouse Square about an hour before the tree lighting. As soon as the kids see Santa, there is a happy rush and a line soon forms. Kids want hugs, conversation and to share their Christmas wishes. Parents and grandparents want photos of the kids. From my perspective, it&apos;s fun to watch all the adults&apos; reactions. I can&apos;t help to think that the grown-ups reconnect with their inner child, just a little, when they watch their little loved ones talk with Santa. Any interesting moments from your time as Santa? A few years back, Santa arrived on the square at the appointed time, and there was another man in a red suit wandering the square. He was clearly an imposter and was quickly ushered to an undisclosed location by some very alert elves. It was certainly an awkward situation but was quickly resolved and none of the children seemed to notice. There are always children who don&apos;t ask for toys, games, puppies, or bicycles. They ask for the things that Santa can&apos;t give: "Please bring Grandma back", "I just want my daddy home from Afghanistan" or "I want a baby brother or sister!" Although it&apos;s Santa&apos;s job to always have an appropriate response to a child, sometimes Santa&apos;s words "That&apos;s a wonderful wish" or "Christmas is about hope and love" just don&apos;t seem to suffice. Sometimes those little eyes peer straight into your soul and remind you about the most important things in life. Why should people come out to Christmas on the Square? It&apos;s simply the best place in Hendricks County to kick off the Christmas season. There are lots of friends and neighbors out and about, but it&apos;s not crowded. There is great local shopping. There is often music and other characters to meet. It&apos;s a great family event. Plus, hot cocoa doesn&apos;t taste better anywhere in the world -- especially if you put a peppermint stick in your cup! You have three great kids, including two that are very young. Do you have to get sneaky so the little ones won&apos;t figure out that it&apos;s daddy in the Santa suit? Yes. If you were to look at my calendar you will never see the word "Santa" but you will see lots of private and corporate "red suit gigs". In our home, "Santa" and "red suit" are used very differently. We try to preserve the illusion for the little kids. My 2-year-old daughter completely buys into Santa in all his forms and presentations. My very clever 3-year-old son gives me the look that he has figured something out -- but isn&apos;t quite ready to say anything. My 17-year-old daughter graduated to the honored status of "Santa&apos;s helper" long ago and frequently dons an elf suit and helps me with appearances. This year&apos;s Christmas on the Square features all of the traditional favorites, like Santa and Mrs. Claus, a live nativity, performances at the Royal Theater by the Danville High School Drama club, and many local merchants selling their creations. New this year is the giant SNOWZILLA inflatable slide. 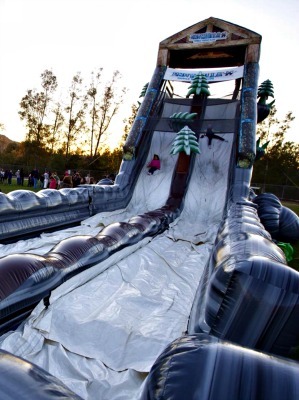 This 30 feet tall by 90 feet wide downhill drop will give you the feeling of sliding down a snowy Alpine mountain. Train rides are also returning this year! Both SNOWZILLA and the train rides are free and will run from 4 to 8 p.m. When: 4-8 p.m., Friday, Nov. 28. Cost: Admission and many events are free, but bring some money to shop local vendors and get a cup of hot chocolate!